(Disclaimer in case it isn't painfully obvious - I'm very much a n00b, especially when it comes to understanding transistors). The code on U1 (a 5V arduino) let me drive the line high or low, or put it in a high-z state to simulate all 3 scenarios. I expected that driving the line low would light the LED at 9V, and driving it high would turn the LED off (0V on the mosfet drain). What actually happened was - no light at all, and the drain having a voltage of 6V (5.9V). I'm quite confused - what's going on here? It's meant to be controlled by even a 3.3V logic level, so 5V should be just fine. There is an error in the O.P. circuit. It will not be able to turn off the LED, so the LED will be on all the time. 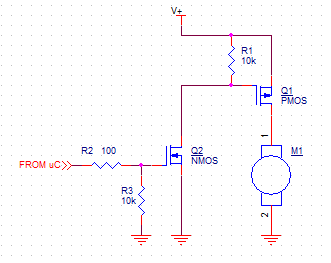 To turn off the P-channel MOSFET, you need to pull the Gate to Source. The Source is always at +9V in your circuit, but the pullup R1 goes only to +5V (VCC). A high side P-channel MOSFET switch often looks like this. 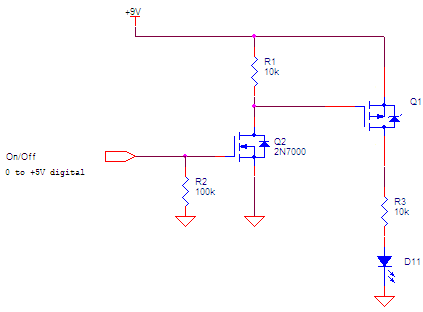 Q2 can be a small N-channel MOSFET or a small NPN transistor. On the other hand, is there a reason for using a high side P-channel switch (as opposed to a low side N-channel switch)? Are you making this setup just to understand P-channel MOSFETs better? You want to pull the MOSFET gate to 9V, not VCC. Once you do this, you can't use the LED_EN pin directly, because it likely won't be 9V-tolerant. 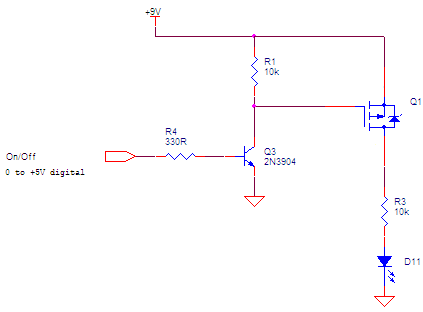 To fix this, you can use an N-channel MOSFET to pull down the gate of the P-FET. You'll need a current-limiting resistor on the LED. Your circuit as is won't work at all. It should always be in the on state because you always have a Vsg>Vthreshold. What you need is the 10k resistor attached to the 9V line, but that will only work if your 5V logic block can block up to 9V in the high-Z mode. Basically, the PMOS will shut off when the high-side is at the same voltage as the gate. 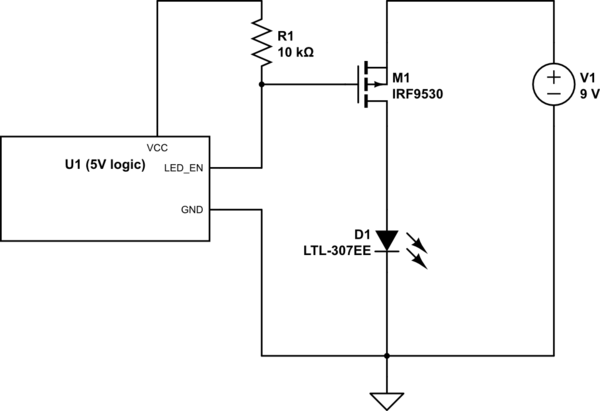 The pmos will turn on when the gate voltage drops ~0.7V (Vthreshold) below the source voltage. To turn on you'll want to drive high-Z and to turn off you'll want to sink the gate voltage down to 0. Driving DC motors with MOSFETs and a microcontroller? Will these heatsinks be sufficient for my mosfets?